Kyle Bruckmann's long running avant chamber ensemble returns with the core lineup of Bruckmann (oboe, english horn), Jason Stein (bass clarinet), Jen Clare Paulson (viola), Anton Hatwich (bass), and Tim Daisy (percussion) joined by Darren Johnston (trumpet) and Jeb Bishop (trombone). 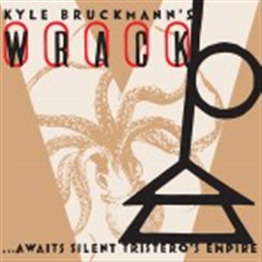 …Awaits Silent Tristero's Empire is a sprawling, kaleidoscopic “musical phantasmagoria” inspired by the novels of Thomas Pynchon, anchored by instrumental settings of fictional song lyrics found in V., The Crying of Lot 49, and Gravity’s Rainbow. It is made possible with support from Chamber Music America's 2012 New Jazz Works: Commissioning and Ensemble Development program funded through the generosity of the Doris Duke Charitable Foundation, and was premiered at the Outsound New Music Summit.